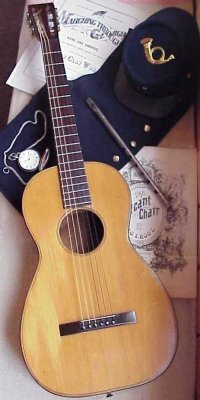 The guitar is a circa 1850 instrument manufactured by William Hall. William Hall & Son is listed in the Directory of American Military Goods Dealers & Makers. Hall is listed in 1845 as an instrument maker. He owned a music store at 1 Franklin Square. In 1861 his business moved to 543 Broadway. Hall had an army contract in 1861 to supply the military with drums, musical instruments, bugles & fifes. The tin whistle in the photograph is identified to Edward Salinger, Company D, 1st New York Dragoons. This regiment served in Grant's Wilderness campaign of 1864. At Cold Harbor the 19th New York Cavalry, bridle-rein in hand, gallantly defended their breastworks while the band played gaily during the entire engagement. The 1st Dragoons were ranked high by their senior commanders for their superior discipline and efficiency. Edward Salinger died in 1911 and is buried at Greenmount Cemetery, Dansville, New York. Both of these items are from John Quinn's Civil War collection.